PSX Bishi Bashi Special 2 (JPN) "Hyper Bishi Bashi Champ" in 09:34.82 by Spikestuff. Bishi Bashi Special 2 brings more of the comical minigames that are a staple of the series. This collection of the arcade games Hyper Bishi Bashi Champ and Gachaga Champ saw a Japanese and a European release (where it was lumped together with the first game). The minigames themselves are very straightforward and usually involve only the Triangle, Cross, and Circle buttons. This is a direct holdover from the original arcade machines, which featured a three-button layout. 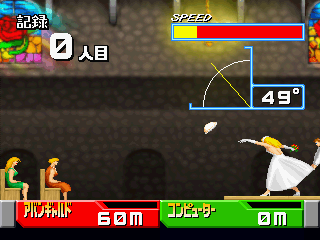 Some minigames also include the directional pad to increase the button-mashing even further. For example, in the first minigame the player has to fend off mobsters by pressing the D-Pad in the direction they're coming from. Watch Spikestuff absolutely demolish his computer opponent in one fast-paced minigame after another!